Drumcoura City is the Home of the COWBOYS AND HEROES COUNTRY MUSIC AND AMERICANA FESTIVAL. It comes on June Bank Holiday Weekend. It is great to see so many people at Drumcoura enjoying the music, the Horse Show and many other activities. See the Cowboys and Heroes website www.cowboysandheroes.ie for further information. THE FRINGE FESTIVAL is also a great succes and comes in July. It is free to all and there is great entertainment. CONGRATULATIONS ON THE ORGANISERS, TRACEY AND GLENN WHO WON THE 2017 AWARD FOR THE BEST FRINGE FESTIVAL IN IRELAND. We have qualified Riding Instructors at Drumcoura. Ron Weisz (previous Chairman of the Irish Quarter Horse Association for 5 years) and Marlene Rutten both hold level 2 certification from the Western Equestrian Society in conjunction with Horse Sport Ireland. The bar and Restaurant known as the Cowboys and Heroes Saloon is open at 6:00pm on Wednesday to Friday and at 1:00pm on Saturday and Sunday. 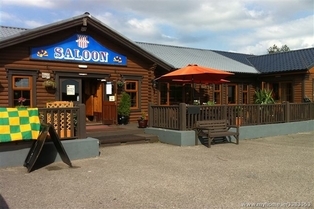 It is a picture of what you would find in the West of America and is the only Western Bar and Restaurant in the County. There is live music on most weekends. The Restaurant has a genuine Smoker which gives a great flavour to the American Style food such as the Ribs, Chicken, Pulled Pork, Burgers and Steaks. The Sweet Potato Fries are not to be missed. Sunday Lunch Menu: There is a special Sunday Lunch Menu every week, which is shown on Facebook page.